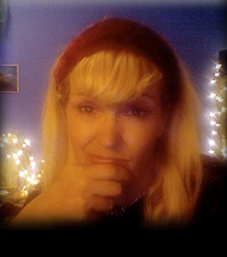 Cathy Vogan is a UK and Australian citizen who has resided in Ireland, Australia, England and France. She has been a Communications and Digital Media lecturer since 1988 and currently teaches in Sydney, in the academic and broadcast sectors. Over the last 3 decades, Vogan has won a number of international awards for her work as a video artist, including the Amnesty International Freedom Art Award (Critics’ Choice) in 2006. In 2010, she shifted focus towards documentary film-making and independent journalism, taking a special interest in the work of Wikileaks, Freedom of Information and Social Justice. Vogan is the one-woman team behind ‘The Wikileaks Tapes’ – a series of in-depth interviews and creative films about Wikileaks, with luminaries such as Daniel Ellsberg, Noam Chomsky and John Pilger – and she has authored the citizen journalist blog thing2thing.com for the last 4 years. In 2014, Vogan began hosting a Sydney community radio show, with the aim of giving a voice to Aboriginal, refugee and activist communities. She remains committed to the core principles of Wikileaks – scientific journalism, with a heart… As a volunteer citizen journalist who is now widely read around the world, Cathy Vogan is living proof that ordinary people really can make a difference. 24 films about the upstart Aussie start-up that changed the world! This edition is born of a self-funded project called ‘Did You Have Any Idea?’ by Australian artist and citizen journalist Cathy Vogan, on her travels across Australia and the US. The mission was to chat, in her own informal way, with high profile and grass-roots supporters of Wikileaks. 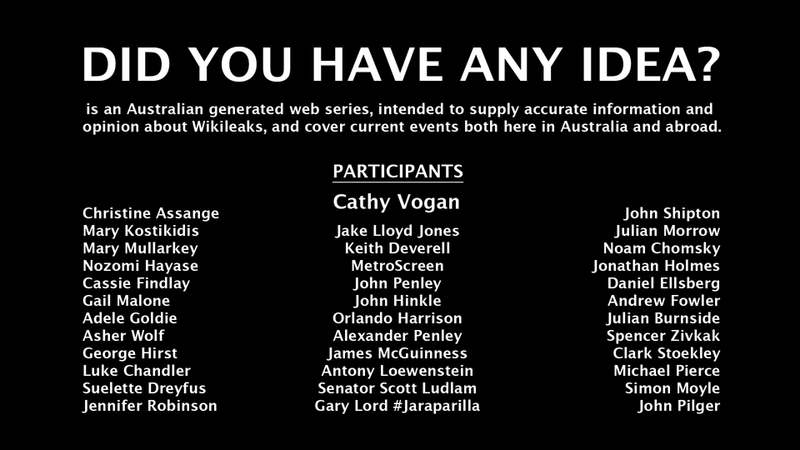 Vogan’s interviewees include Professor Noam Chomsky, Daniel Ellsberg, Mary Kostakidis, John Pilger, Andrew Fowler, Jonathan Holmes, Julian Morrow, Julian (brief appearance) & Christine Assange, John Shipton, Senator Scott Ludlam, Nozomi Hayase & Rap News, Julian Burnside QC, Gary Lord (@jaraparilla), Michael Pierce SC, Spencer Zifcak, Larry Buttrose, Clark Stoeckley, John Penley, Andrew Partos, Gail Malone, Cassie Findley, Antony Loewenstein and Gary Kennedy. 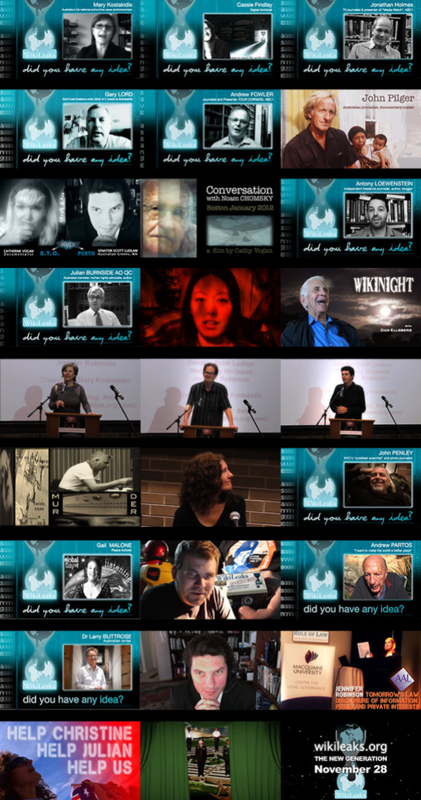 This historical resource (on dual layer DVD) assembles the entire ‘Did You Have Any Idea?’ series, and other related films by Cathy Vogan, to give a wide-ranging perspective on the Wikileaks phenomenon. Read a review in Green Left Weekly. Citizen journalists are often characterised by their choice of one core issue they really care about, and are willing to research rampantly; day in, day out, for years. Thus their expertise on the subject tends to become second to none, even that of professional journalists, who are obliged by their employers to spread themselves across a variety of issues. CJs often crowd-source and research their ideas within the context of specialised social media groups, comprised of other passionate individuals who voluntarily share their knowledge, offer feedback and facilitate connection to both sources of information and a world of readers. The technically adept citizen journalist may act as the chosen megaphone, but the voice is collective. Together, they are the watch-dogs of the main-stream media, and each other… As a movement, citizen journalism is becoming the foundation stone of a more independent, diverse, and transparent historical record. If you value the future of citizen journalism, then make it thrive by offering a donation. Hi Cat, could you please upload the speech by Mr. Lindskog as well? It’s not uploaded anywhere yet. Yes it is, on the University of Adelaide website. Link is on the new article with the rest of the speakers and Q & A.